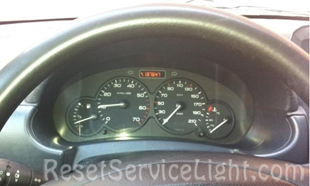 Reset service light indicator Peugeot Partner Van (5). From years: 1996, 1997, 1998, 1999, 2000, 2001, 2002, 2003, 2004, 2005, 2006, 2007, 2008, 2009, 2010, 2011, 2012. How to reset service light indicator Peugeot Partner Van (5). Ensure the ignition switch OFF. Push & hold the odometer button the one that reset the km / miles. Switch ON the ignition, do not start the car. Keep the odometer button pressed down for about 10 seconds, all this time will begin a countdown from ten to zero. After ten seconds on the display will show something like this “= O″. Switch the ignition ON and check if the warning light was reset. That it is the full procedure how to reset service light indicator Peugeot Partner Van (5). If you like to reset any maintenance oil light after an oil change. Or reset check engine light, airbag light, inspection key or insp errors when maint reqd, for Peugeot cars. Or any warning light for service reminder which appears on the display. Write in the search box the car name for which you want to find information, and find how to reset other service reminders when by yourself. Click hear to see full procedure how do you reset the oil light indicator. How to reset the maintenance light and how do you reset service light for all Peugeot vehicles.